So while I can’t take credit for coming up with this one, I can take credit for the adult version of this. Aren’t they just gorgeous? Dissolve each box of jello separately, using just one cup of boiling water per flavor. Pour into individual containers (small tupperware lightly sprayed with pam works well) and chill overnight. Once solid, cut the flavors of jello into small blocks and mix together carefully in a glass 9×13 pan. In a separate bowl, dissolve 2 envelopes unflavored gelatin in 2 cups hot water. Let cool a bit and stir in the condensed milk. 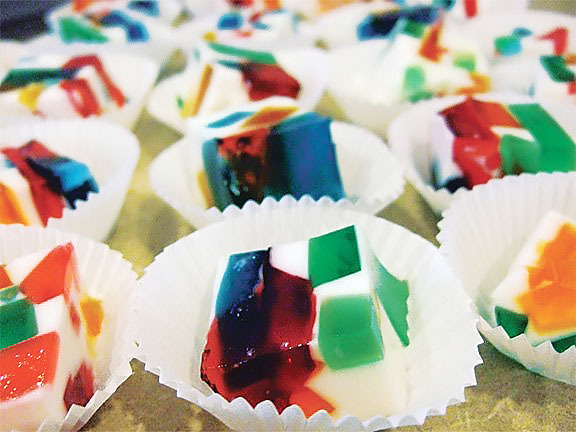 Cool to touch and pour cooled milk mixture over jello and chill overnight. Want to give them a bit of an adult twist? Instead of one cup of boiling water for every 3 oz of jello, use 1/2 cup boiling water and after dissolving the jello, pour 1-3/4 cup of 80 proof vodka. This recipe is for 80 proof vodka. If you use any other proof, you will need to adjust the ratio. Don’t ask me how though. Anytime I use a vodka of a different proof, the jello doesn’t set correctly. The water be boiling and the powder dissolve completely. If you use anything less than 1/2 cup, the jello will not set correctly. You can increase the amount of vodka up 2 cups, but any more than that and it will be soft and slimy.